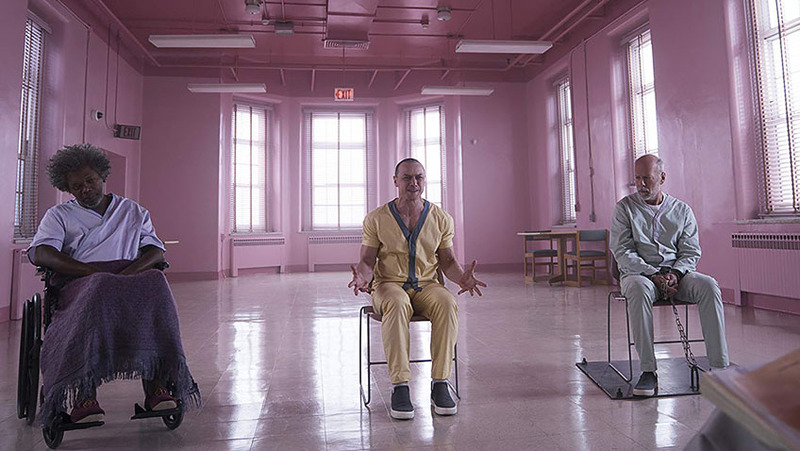 Joyce Glasser reviews Glass (January 18, 2019), Cert. 15, 129 min. Glass is the third film in a trilogy that began with M. Night Shyamalan’s (The Visit, Signs, The Sixth Sense) haunting and imaginative, big-budget superhero film Unbreakable in 2000 and continued sixteen years later with Split starring James McAvoy as Kevin Wendell Crumb and 22 other personas. It is challenging to base a trilogy on films set 18 years apart (although four of the original key characters return for Glass ). However, in the interim, we have had dozens of innovative superhero (and villain) movies that have changed the face of superhero comics forever, including, as in Glass , films featuring anti-superhero organisations (e.g. the Avengers: Infinity War) and individuals (e.g.The Incredibles 2). These challenges aside, it is co-producer/writer/director M. Night Shyamalan’s failure to give his amazing three actors a story worth telling that detracts from the film. The problem with reviewing Glass is that unlike Unbreakable and Split , which are stand alone films, Glass depends on viewers not only having seen the previous two films but remembering them in some detail. If you do not, much of Glass will be incomprehensible, and a few references, casting decisions and in-jokes. So here is a brief reminder. 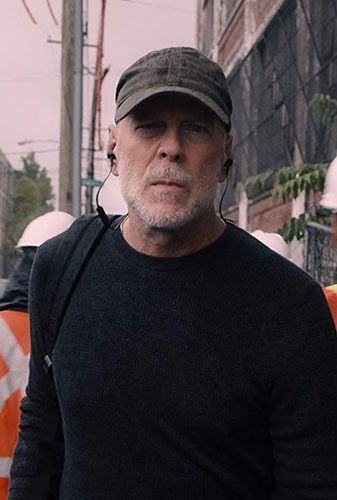 In Unbreakable, Bruce Willis played an ordinary security guard, David Dunn questioning his life after giving up a football career and losing his wife. He realises that their son, Joseph, is unhappy. Returning from a job interview one day, Dunn becomes the sole survivor of a train accident engineered by technical mastermind Elijah Price AKA Mr Glass (Samuel L. Jackson). Dunn meets Price after finding his card at the funeral of the crash victims and paying him a visit. Mr. Glass is a sinister comic book therorist with a brilliant, if warped, mind. Since childhood, however, he has suffered from a rare disorder: Osteogenesis Imperfecta, that makes him prone to broken bones and weak muscles. Glass is trying to find his opposite, but Dunn is not convinced that he is a superhero of extraordinary strength. Dunn does realise that through physical contact with a stranger – brushing against them in a crowd – he can visualise past crimes and recognise a criminal. His only weakness is water (there is a helpful near drowning flashback in the film). The second installation came in the surprising form of 2016’s low-budget psychological horror film entitled Split referring to the anti-hero’s split personality. 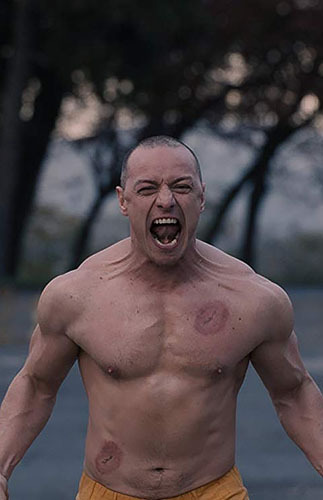 James McAvoy plays former abused child Kevin Wendell Crumb, a former Philadelphia Zoo employee with 23 personalities, the latest of which, The Beast, marks him as a super villain. It is a bit like Bruce Banner and The Incredible Hulk without the romance, heroics and good causes. Kevin was severely abused by his deranged mother, particularly after his father died in a train crash (get it?). In Split Kevin has kidnapped three girls, one of whom, Casey (Anya Taylor-Joy is spared because, like Kevin, she has suffered from an abusive uncle. At the end of Split, David Dunn makes a surprise appearance in a diner recalling the name of Mr Glass. The third film in the trilogy, Glass , begins three weeks after this incident in the bar. Dunn owns a security business and works with his now grown-up son Joseph (Spencer Treat Clark, from Unbreakable). Joseph is protective of his father because the police are after him for his vigilante work. Don’t forget that Dunn can identify potential criminals by bumping into them on the street or other contact, and with his superhuman strength, he can dispense with justice on the spot. Joseph and Dunn are now searching for four missing cheerleaders and Joseph’s technology has identified Kevin’s lair. Just as the Beast is about to terrorise the chained teenagers, Dunn appears and challenges his nemesis. Both Kevin and Dunn are arrested, however and carted off to a private psychiatric hospital run by Dr Ellie Staple (Sarah Paulson), who is dedicating her services to the most acute patients: the new Kevin Wendell Crumb and David Dunn and Staple’s patient of many years, Elijah Price. When Dunn learns that is enemy, Price, is in the adjacent room, he is determined to destroy him, and finish off the Beast as well. Meanwhile, Glass enlists the Beast to help him escape and destroy Dunn. As Glass has, like Casey, known pain, he will not only be spared by the Beast, but guided by him. Staple’s approach is to talk the men out of their superhero fantasies by persuading them that there is an explanation for each of their so-called superhuman strengths. She wants to convince them that they are suffering from delusions of grandeur. Glass, who sits in his wheelchair in a catatonic state until he is in the company of Kevin or Dunn, has left his room undetected by the security cameras and has been a busy man, using the hospital’s security recording cameras for his own ends. 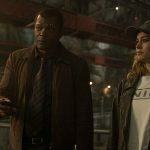 The fight scenes between The Beast and Dunn are old fashioned and amateurish (or perhaps the budget has been spent on the three leads) by today’s standards and the wait for something to happen in the hospital feels like filler. In the hospital, where oddly, there is only one orderly on night duty despite the dangerous inmates, there is a lot of talk but little plot or character development. If it is not obvious that Ms Staples (oh, how we miss Betty Buckley as Kevin’s shrink in Split) has an agenda, Shyamalan eventually spells it out for us. And when that aspect of Ms Staples is revealed, it’s nothing new. But you still have to wonder how she can retrain the men without due process of law. This is particularly the case as the patients each have a champion pleading mercy for their loved ones. Joseph has tried in vain to persuade the police that his dad is a good guy. Price’s mother (Charlayne Woodard, from Unbreakable) comes to the hospital as does Joseph and Casey (Anya Taylor-Joy from Split) who alone has the ability to get through to Kevin and show him he is in control and does not need the Beast’s protection. The three champions form a bond and become, by default, the messengers who spread the word (via social media) that superheroes really do exist. This is all carried out a high-minded seriousness that is far too heavy for a film that has not engaged us or convinced us there is anything at stake. You long for some wit and humour. Bruce Willis might have walked his way through roles over the past decade or two, but he can still deliver a witty line like few other actors. Jackson is always magnetic, and is so here – until he starts talking. McAvoy continues switching between personas faster than Alec Guinness in Kind Hearts and Coronets, but it’s the same performance as in Split where he already impressed us for two very tense hours. Here, it’s too much of a good thing.